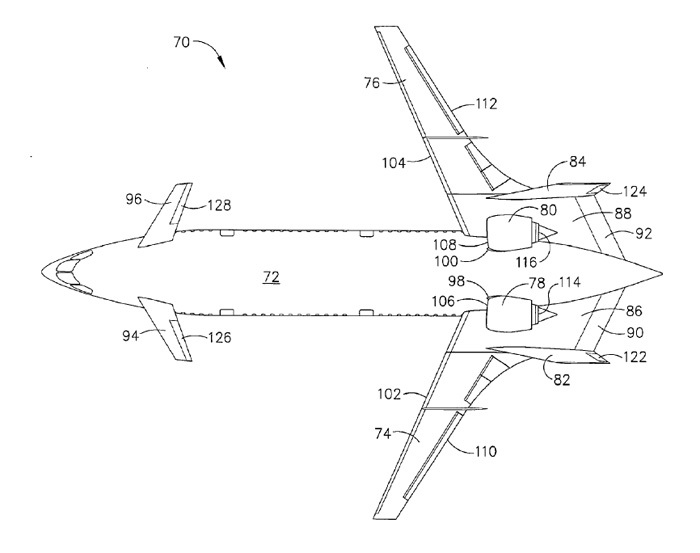 Boeing filed an interesting patent for a newly designed commercial airliner. 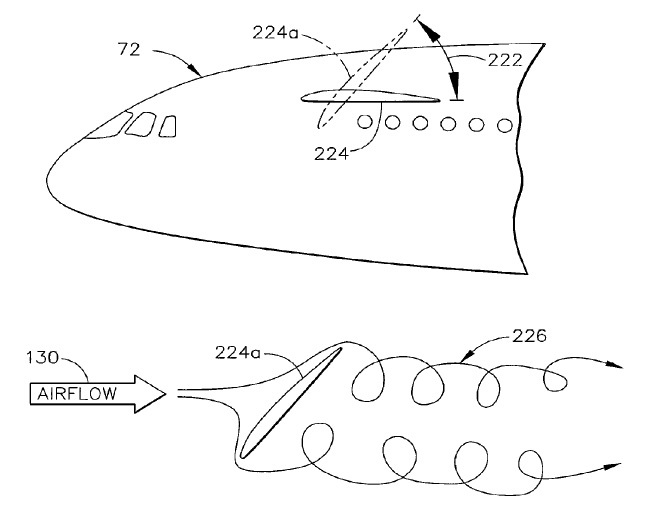 According to the patent application, the airliner is designed to be more eco friendly and to reduce the level of noise and infrared radiation. 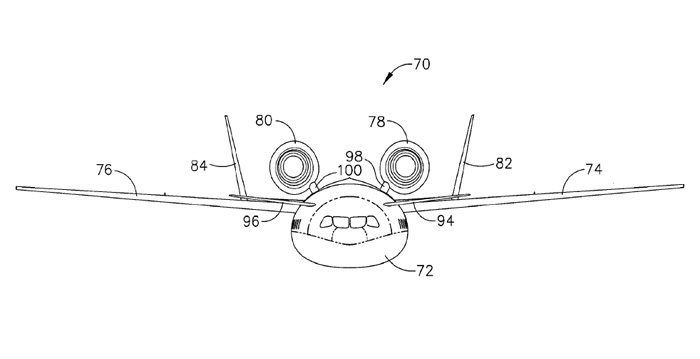 The concept aircraft features forward swept wings and engines mounted higher than the wings. Vertical stabilizers are mounted on each wing outboard of the engine. The aft deck extends far behind the engines and includes an upwardly rotatable pitch control surface. This control surface may deflect noise and heat from the engines upward, like during takeoff or approach. The engine type was not specified but may vary between turbofans, prop-fans (unducted fans) and turbo-probs. Main wings are mounted above the longitudinal axis of the fuselage. The design also features canards that will be mounted above or below the axis. The canard may be fully rotatable to provide a significant control authority. The canard could be used as a braking device during runway deceleration. According to the application a high mounted canard may be able to fold out of the way of the passenger boarding bridge, a low mounted canard may be tailored to slip under a boarding bridge. Unlike an conventional airliner, the fuselage may have a more elliptical shape with flattened bottom side. 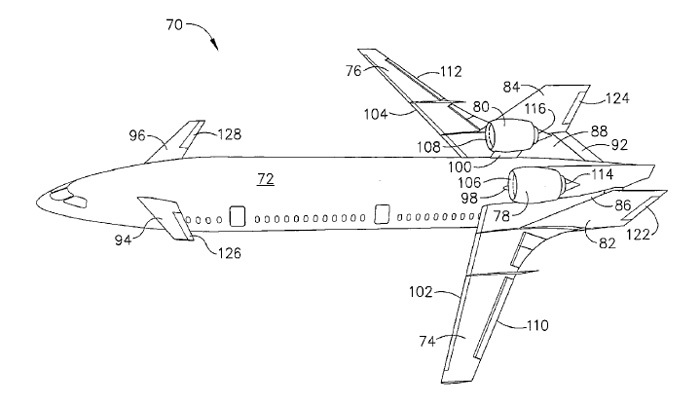 This will shorten the aircraft and allows more seats in each row. 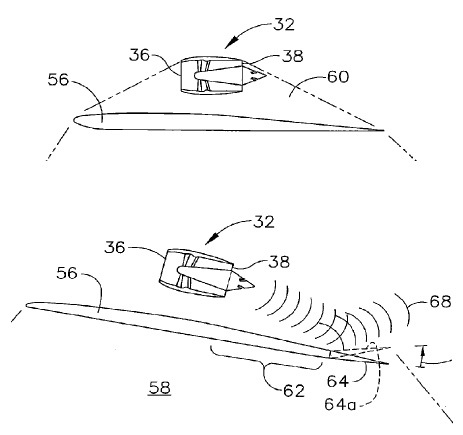 The patent application was already filed on 16 Nov 2010 but has been published just recently. 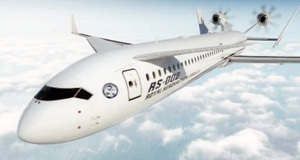 The Boeing design has many similarities with design concepts previously published by Airbus and Royal Aeronautical Society. I wonder how far along they are with developing this? It’ll be cool to see some new designs in the sky like this with the wings swept forwards. 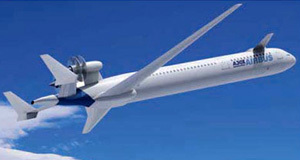 I have a very different design for aircraft which can be save all passengers if even both engines does not work in sky. Every body thinks himself best, so i am. I have been flying a Canard since 1998 and have always consider since 1998 that from a safety point of view that jet canard passenger planes should be the norm. Irrespective of instruments the aircraft (the canard) tells the pilot whether he is flying the aircraft at the right speed and attitude. isnt canards a Little bit out of fashion nowadays?